Jupiter’s moon Io is the most volcanically active world in the Solar System, with hundreds of volcanoes, some erupting lava fountains up to 250 miles high. 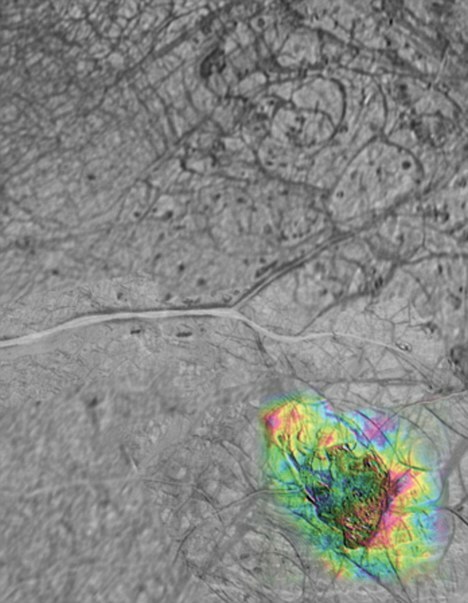 However, concentrations of volcanic activity are significantly displaced from where they are expected to be based on models that predict how the moon’s interior is heated, according to NASA and European Space Agency researchers. This five-frame sequence of images from NASA’s New Horizons mission captures the giant plume from Io’s Tvashtar volcano. Snapped by the probe’s Long Range Reconnaissance Imager (LORRI) as the spacecraft flew past Jupiter in 2007, this first-ever movie of an Io plume clearly shows motion in the cloud of volcanic debris, which extends 330 km (205 miles) above the moon’s surface. 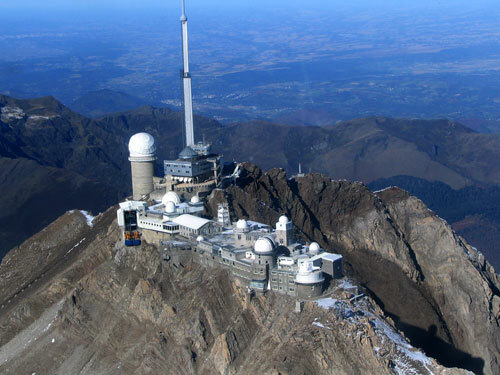 Only the upper part of the plume is visible from this vantage point. The plume’s source is 130 km (80 miles) below the edge of Io’s disk, on the far side of the moon. Io’s hyperactive nature is emphasized by the fact that two other volcanic plumes are also visible off the edge of Io’s disk: Masubi at the 7 o’clock position, and a very faint plume, possibly from the volcano Zal, at the 10 o’clock position. Jupiter illuminates the night side of Io, and the most prominent feature visible on the disk is the dark horseshoe shape of the volcano Loki, likely an enormous lava lake. Boosaule Mons, which at 18 km (11 miles) is the highest mountain on Io and one of the highest mountains in the solar system, pokes above the edge of the disk on the right side. The five images were obtained over an 8-minute span, with two minutes between frames, from 23:50 to 23:58 Universal Time on 1 March 2007. Io was 3.8 million km (2.4 million miles) from New Horizons. 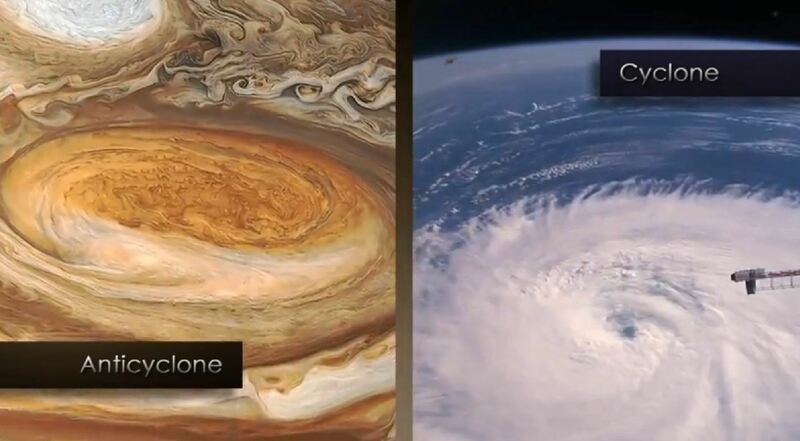 New movies of Jupiter are the first to catch an invisible wave shaking up one of the giant planet’s jet streams, an interaction that also takes place in Earth’s atmosphere and influences the weather. 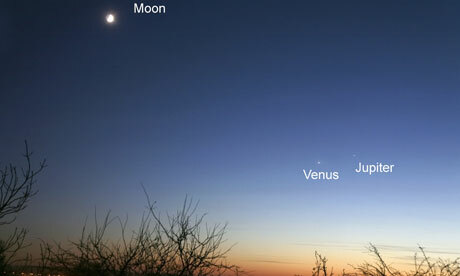 The two planets will appear side-by-side in western skies for the next two evenings – offering a dazzling spectacle. So where and how can you best see them? 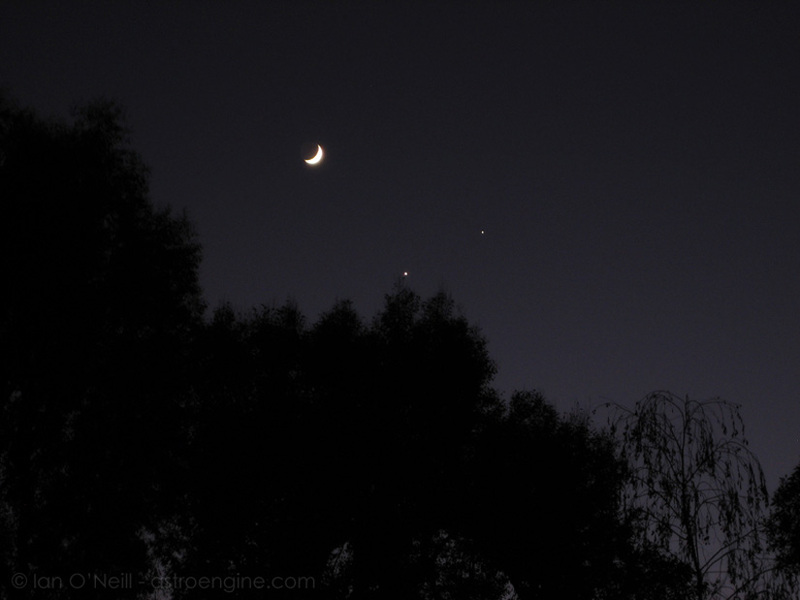 After the moon, they are the two brightest objects in the night sky, and for the next few evenings they will appear side-by-side in western skies in a dazzling heavenly spectacle. 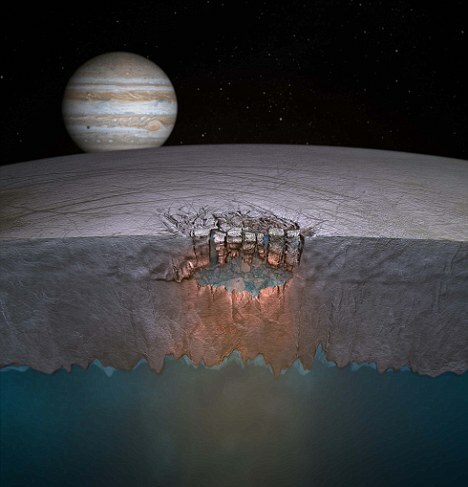 Scientists have often speculated that Jupiter’s moon Europa might contain hidden oceans – and thus the potential for life. But lakes buried too deep beneath the surface would be sterile. Now, computer simulations based on scans of ‘chaos terrain’ on the aurface suggest that an ‘ice cave’ might be buried near enough the surface to support life, with a floating ‘cap’ leading to a cave of salty slush. It would contain as much water as the American Great Lakes. The salty lake is thought to be locked within Europa’s icy outer shell a few kilometres from the surface. Other large pockets of liquid water are also likely to exist on the moon, it is claimed. Scientists are excited by the discovery, which offers one of the best hopes yet of finding life beyond the Earth. 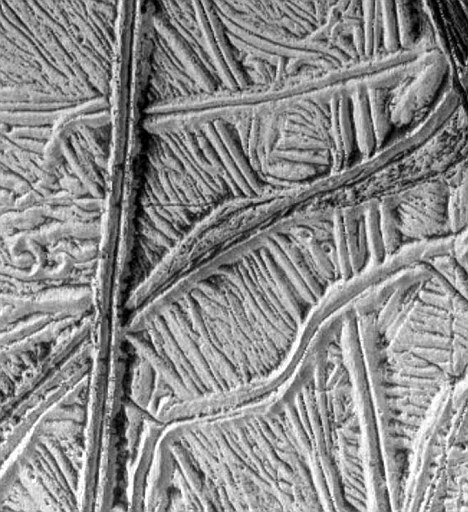 Evidence for the ice-covered lake in Europa’s Thera Macula region is seen in the shape of the terrain above it. The site appears to be marked by a fractured and collapsing lid of floating ice. On Earth, similar features in the Antarctic are caused by briny seawater penetrating and weakening ice shelves. They are also present in Iceland, where glaciers are heated from below by volcanic activity. Scientists have long suspected that a liquid or slushy ocean exists under Europa’s surface, warmed by the tidal forces of Jupiter’s powerful gravity. Theoretically, a liquid water ocean could provide a suitable habitat for life – but only if it was not too far from the surface. Experts disagree about how thick the layer of covering ice is. The new research, based on images from the Galileo probe, suggests that water ‘lenses’ could lie as little as three kilometres below the bottom of the surface crust. Lead scientist Dr Britney Schmidt, from the University of Texas, said: “One opinion in the scientific community has been, ‘If the ice shell is thick, that’s bad for biology – that it might mean the surface isn’t communicating with the underlying ocean’. The research, published today in the journal Nature, involved computer simulations based on observations of Europa and Earth. 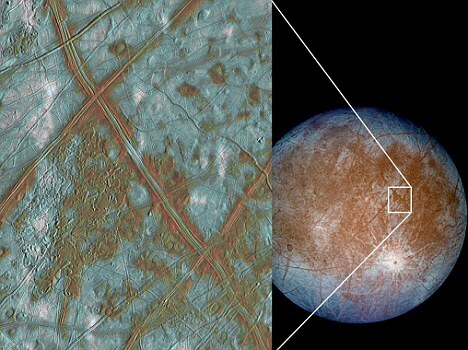 Dr Schmidt’s team focused on two circular bumpy regions on Europa’s surface – known as ‘chaos terrains’. Their existence will only be confirmed by a new space mission designed to probe Europa’s ice shell. Such a mission, likely to employ ground-penetrating radar, is now under consideration by American space agency Nasa. 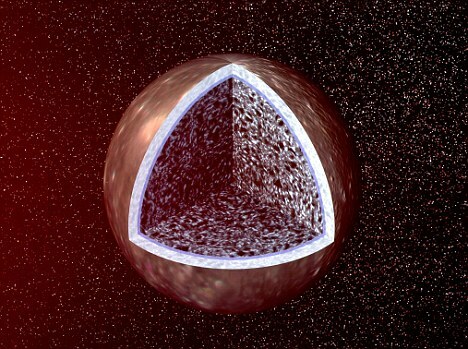 The moment of inertia of a giant planet reveals important information about the planet’s internal density structure and this information is not identical to that contained in the gravitational moments. The forthcoming Juno mission to Jupiter might determine Jupiter’s normalized moment of inertia NMoI=C/MR^2 by measuring Jupiter’s pole precession and the Lense-Thirring acceleration of the spacecraft (C is the axial moment of inertia, and M and R are Jupiter’s mass and mean radius, respectively). We investigate the possible range of NMoI values for Jupiter based on its measured gravitational field using a simple core/envelope model of the planet assuming that J_2 and J_4 are perfectly known and are equal to their measured values. The model suggests that for fixed values of J_2 and J_4 a range of NMOI values between 0.2629 and 0.2645 can be found. The Radau-Darwin relation gives a NMoI value that is larger than the model values by less than 1%. A low NMoI of ~ 0.236, inferred from a dynamical model (Ward & Canup, 2006, ApJ, 640, L91) is inconsistent with this range, but the range is model dependent. 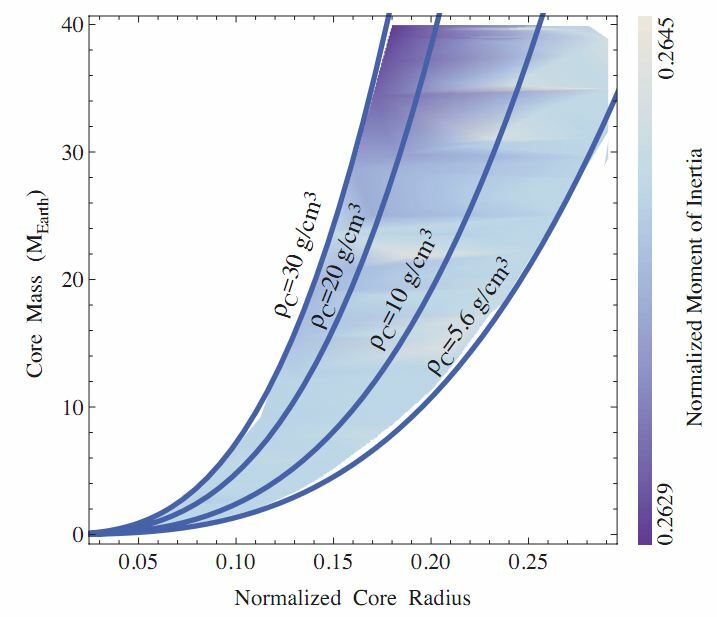 Although we conclude that the NMoI is tightly constrained by the gravity coefficients, a measurement of Jupiter’s NMoI to a few tenths of percent by Juno could provide an important constraint on Jupiter’s internal structure. We carry out a simplified assessment of the error involved in Juno’s possible determination of Jupiter’s NMoI.